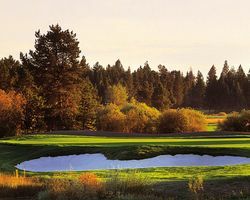 Honored by Golf Digest as one of "America's 100 Greatest Courses," and host of the 2007 - 2010 JELD-WEN Tradition major championship, Crosswater is a heathland-style course situated on 600 magnificently scenic acres of woodlands and carefully preserved wetlands. 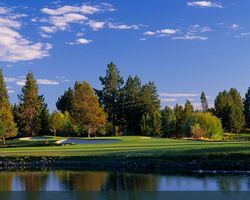 The course features five tee placements for each hole, bent grass fairways and greens and is threaded by the gently flowing Deschutes and Little Deschutes Rivers. In fact, depending on tee selection the rivers can come into play as often as seven times in a round. 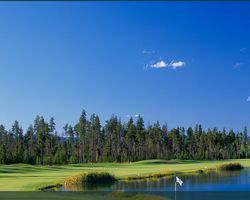 You Must Stay at Sunriver Resort to play this course please see the resort information on the lodging page. Meadows is acclaimed architect John Fought's latest creation. Meadows features tremendous variety within its 18 holes, seven of which border the meandering Sunriver. Fought's design pays tribute to the great American courses from the 1920's and 30's with its aesthetic grace, while its dramatic use of directional and fore-bunkers serve up ample challenges for golfers of all skill levels. The Meadows course has played host to numerous USGA and NCAA golf championships, including the NCAA Men's Division I championship tournament. NOTE: Mandatory caddie fee not included in the green fee and to be paid on day of play at the course. 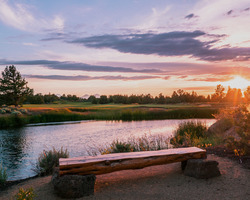 Pronghorn's 7,381-yard, par-72, 18-hole Nicklaus course is intertwined with ancient lava rock ridges and outcroppings and has spectacular panoramic views of nine snow-capped mountain peaks. Designed to play like a genuine desert course and with the truest putting surfaces, the Nicklaus course plays firm and fast. Nicklaus' attention to detail combines strategy with playability, and risk versus reward to accommodate golfers of every skill level.